Learning about talent management and negotiation is never an easy feat. That’s why top talent agencies are around to serve as an example. CAA has come a long way since its establishment in 1975. Since then, it has relocated to Century City, Los Angeles, California. Overall, the company is well-known for its high-profile clients, ranging from film to sports, like Meryl Streep, Steven Spielberg, Derek Jeter, and David Beckham. Boras Corporation a single-sport entity focused on signing baseball players. Its founder and president, Scott Boras, rose to fame by making one of the most high-profile negotiations in history. Without any experience, Boras was the first baseball agent to negotiate over $50 million in contracts with clients like Greg Maddux, Kevin Brown, and Alex Rodriguez. Wasserman Media is primarily a marketing agency for individuals and companies. They support their clients’ presences across various platforms using targeted ads, social media, and branding services. It is one of the leading endorsement contract negotiations for NBA, NFL, golf, and tennis athletes. Excel Sports Management is known for representing the youngest names in basketball and baseball– from Clayton Kershaw, Masahiro Tanaka to Kevin Love and Joc Pederson. The company rose to greater prominence after successfully signing the golf giant, Tiger Woods. Independent Sports & Management is ranked as the third most valuable sports agency in the US. The company is responsible for signing more than 300 MLB, NFL, and NBA players. While ISE is known for sports contracts, the agency has expressed its desire to expand in the entertainment space and sports technology. Trident Media Group is well-known for its roster of clients that have appeared on New York Times Best Sellers Lists and major awards. These prizes include the most prestigious literary awards like the Pulitzer Prize, the National Book Award, The Booker Prize, and the P.E.N. prizes, among other awards. Sterling Lord Literistic bore the names of canonized American authors like Howard Fast, Ken Kesey, Jack Kerouac, and John Irving. Sterling Lord has since transitioned from traditional literary fiction into a more commercial approach on publishing. While Writers House has since expanded from a literary agency into a film and estate representation agency, its reputation still rests on its published authors. Writers House is responsible for some of the biggest names in commercial fiction and children’s books such as Neil Gaiman for Coraline, The Graveyard, and Sandman. The agency has represented authors that have won various awards in sci-fi, fantasy, thriller, and illustration categories. Marly Rusoff & Associates was established by veteran publishing agent Marly Rusoff. One of Rusoff’s incredible feats was to sign six-figure projects for first-time authors like Fredric Alan Maxwell’s Bad Boy Ballmer and Arthur Phillips’ Prague. The agency is also involved in developing book proposals and overseeing the marketing and promotion of their authors. Foundry Literary + Media is an all-around literary agency that represents individuals in film and TV, online media, and foreign publishing. The agency is known primarily for its best-selling YA and serious non-fiction. Established in 1977 by Harry Abrams, Abrams Artists Agency now stands as one of the most diverse and well-respected talent and literary agencies in the US. It has since expanded to Los Angeles and New York and is known for signing child commercials and voiceovers. Osbrink Talent Agency is a full-service agency that supports talents in commercials, voice-overs, print, and television. The company supports both adult and child talents, where most of its child talents are developed in-house until adulthood. United Talent Agency is one of the biggest talent and literary agencies in the world with offices in Los Angeles, New York, London, Miami, Nashville, and Malmo. They are responsible for some of the biggest signings in video games, digital media, fine arts, and commercials. Since its humble beginnings in 2005, CESD Talent Agency has grown to become one of the most prestigious influencers in the US. CESD offers representation for kid-friendly positions in animation and gaming, puppeteering, and television. DNP is one of the oldest voiceover agencies in the US. The agency’s recent launch of its on-camera department has not brought the spotlight away from its impressive list of projects: Timmy on The Fairly Odd Parents and Bubbles on Powerpuff Girls to name a few. TGMD is one of the leading voiceover agencies in the US. The company is responsible for giving voice to the most distinct characters such as Optimus Prime and Eeyore, whose voice belongs to Peter Cullen. SBV Talent offers equally impressive representation for its on-camera and voiceover talents. The agency offers full-service commercial representation to all of its clients, composed of a very diverse set of individuals performing for commercials, animation, and TV shows. Elite Model Management is one of the top fashion modeling agencies in the world, first originating in Paris in 1972 but now having expanded to locations all over the world, with a large presence in New York. Some of the top models around the world come from this agency. IMG Models is a branch of the fashion, sports, and media organization, IMG Worldwide, and runs as an international model management firm. With offices located in main cities all over the world, including London, Milan, Paris, Los Angeles, and New York, IMG Models has several famous models on its team, including Heidi Klum and Gisele Bundchen. DNA Models or DNA Model Management is one of the top three agencies in the world, in terms of revenue and model fame. Established in 1996, DNA Models has already grown to host some of the biggest names in the modeling world today. Ford Models was established in 1946 by the famous Gerard Ford and his wife, Eileen Ford. It is now one of the top modeling agencies in the world, with hundreds of famous models representing their ever-growing brand. They also have offices in Paris, Miami, Chicago, and Los Angeles. Next Management is a talent and modeling agency that was founded in 1989 and was originally named Next Model Management. With offices around the world, Next Model Management focuses on finding clients who are more than just models, with a list including actors, fashion bloggers, musicians, and other hybrid stars. Paradigm Talent Agency is one of the largest agencies in the world, representing clients from all areas and industries, including music, television, film and movies, theatre, modeling, literary publishing, commercial, content finance, digital, and more. They are an umbrella organization that has purchased and taken over many other smaller agencies over the years. ICM Partners is a full-service talent and literary agency that represents clients from various fields, including television, publishing, music, motion pictures, live performance, new media, and branded entertainment. With its headquarters in Constellation Place, Los Angeles, it also has large offices in New York, Paris, and other major cities. 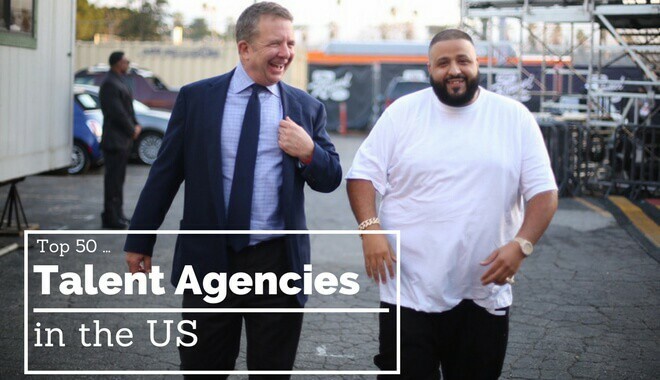 William Morris Agency is the longest-running talent agency in history, with its foundations set down in 1898. In 2009, it merged with Endeavor to become one of the top agencies worldwide. This agency is famous for having signed screen legend Charlie Chaplin in 1910. Cinematic Music Group (CME) is a record label and music agency that is owned by Sony Music Entertainment and was founded by Jonny Shipes. They specialize in hip-hop artists, with Sean Kingston publishing his debut album with this label. The Agency Group prides itself on being the world’s leading independent talent booking agency, with a roster of over two thousand speakers, musicians, authors, and chefs. They help drive and create successful careers for hundreds of their clients, shaping culture and society with their recognizable names and brands. Don Buchwald & Associates was founded in 1977 by renowned agent, Don Buchwald, and is now one of the top talent agents in Los Angeles and the world. Don Buchwald & Associates has recently been making a comeback, climbing up the ranks over recent years. Innovative Artists always has its eyes open for the latest young talent to drop by in Hollywood. They are known to scoop up young and beautiful talent and turn them into the upcoming sensations of tomorrow. The Agency for the Performing Arts (APA) is famous for choosing clients who do more than just act; they search out for those specifically with a multitude of performing arts talents, which is why they have several musicians and comedian actors on their roster. The Gersh Agency is known in Hollywood as Gersh or TGA, and it is famous for having successfully found several stars who have gone off to make multi-million dollar movies. The agency is nearly seventy years old(1949), with over a hundred employees and agents. Size: They represent almost 200 players in hockey, basketball, football, and baseball. Octagon is one of the fastest growing sports talent agencies in the world, with top agents including Scott Pucino and Miikee Liut that have brought in nearly a hundred million dollars worth of commissions. Newport Sports Management (NSM) is the premier agency for hockey players in North America, with over 125 NHL clients on its roster, assisting them with full time legal, financial, tax, marketing, and insurance help. MVP Sports Group is a sports boutique agency that was started by renowned sports agent Dan Lozano. They represent a select group of 25 clients, with overall contract values reaching nearly a billion dollars. ACES was founded by a pair of top agents in the MLB world: Sam and Seth Levinson. They now represent over fifty star athletes, with total contract values exceeding $845 million. Since their inception, they’ve earned over $40 million in commissions. With superstar agents Alan Hermann and Brian Mackler at the wheel, SportsStars has earned nearly $20 million from their contracts, and it is considered one of the fastest growing and highest value sports talent agencies in the world. What’s unique about The Legacy Agency is that they don’t limit themselves to a single sport and instead deal with multiple sports; secondly, they also represent broadcast journalists and announcers, expanding beyond just athletes. As the name suggests, Lagardere Sports and Entertainment is an all-around sports management company that has clients from football to golf. Its leading agents include Joel Segal and Steve Loy. The company has an approximated $1 billion in active contracts and over $43 million in commissions. While Priority Sports and Entertainment isn’t as big as most sports agencies—in fact, small enough to be dubbed a “boutique agency”—its massive influence in both football and basketball is unmistakable. The company’s prominent clients include Mark Bartelstein and Michael McCartney. Athletes First is responsible for representing major league football players in the US. With David Dunn as one of its leading agents, it’s no surprise that the company makes over $26.8 million in commissions. To NFL geeks, the Rosenhaus Sports Representation agency might ring a bell as one of the leading groups responsible for major league hauls. Among the many talented names hailing from this company include Greg Hardy and Joe Harden. As the name would suggest, Diverse Talent Group is a hybrid agency that represents all sorts of talents from actors to writers. While relatively new, the company has an impressive portfolio for working with big retail companies like Abercrombie & Fitch, Zara, and Mango. Although relatively young, New York Model Management is already a leading modeling agency that is known for representing young and diverse faces in the fashion industry. One of the well-known names hailing from New York Model Management is the legendary Naomi Campbell. This powerful female modeling agency is among the top companies in the fashion world. Since it was founded in 1967, Wilhelmina Models has fostered the growth of many international models like Kendall Jenner, Robyn Lawley, and Janice Dickinson. Although International Creative Management Partners isn’t dominated by A-list movie stars like other companies, this agency is actually home to many names on TV, most notably screenwriters and producers. Take for example Modern Family’s own Christopher Loyd and Jerry Seinfeld. ICMP is also home to many bestsellers, including over a hundred New York Times best-seller authors annually. The Alpern Group is well-known for its roster of topnotch producers and screenwriters. The company is presently a hybrid between a talent and a literary agency, and consistently produces award-winning TV shows and mid-range talent every year. Callamaro Literary Agency is a cross-breed between books and film. The agency proudly represents screenwriters, producers, directors, as well as authors. It is one of the emerging agencies in Hollywood. Featured Artists Agency is home to many talented screenwriters. Among its recent projects include the films Under The Same Moon, Looper, Red, and Free Ride. Aside from big-screen movies, the agency is also responsible for some literary publication such as memoirs and autobiographies. Every movie and TV buff should thank Original Artists for cult classics like Karate Kid and Rings. Aside from representing movie producers and screenwriters, the agency also offers financing opportunities for independent projects for domestic distribution. Preferred Artists’ unique selling point is its focused attention to the jazz industry. From musicians to producers to screenwriters, this agency is able to do justice to all jazz-related projects and artists.